There have been many adaptations of the Arthurian legend for film and TV. These range from serious gritty drama, romantic comedy, a Monty Python version, television teen dramas, and a handful more for younger audiences. 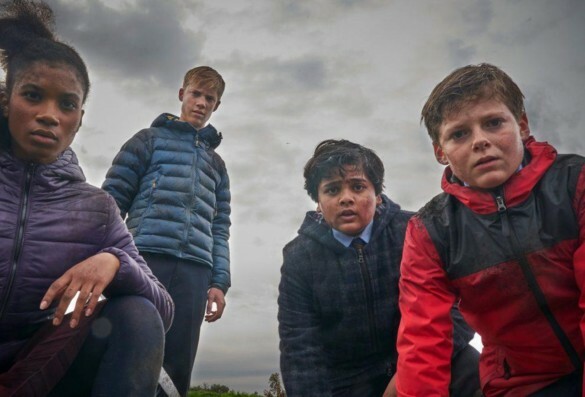 Joe Cornish’s The Kid Who Would Be King is an adolescent adaptation that is meant to be entertaining for both children and adults. The film is getting mixed reviews so far, but I belong to the group that enjoyed it. The Kid Who Would Be King is a coming of age adventure story that parallels themes from traditional King Arthur legends. Evil sorceress and popular King Arthur antagonist Morgana has been imprisoned for hundreds of years- but an imminent eclipse and the current unharmonious state of the world (maybe a hint to Brexit?) will give her the opportunity to escape. Main protagonist Alex (Louis Ashbourne Serkis, son of Andy Serkis) happens upon mythical sword Excalibur, pulls it from a “stone” (concrete and rebar), and finds himself at the center of a medieval adventure. He recruits his best friend Bedders (Dean Chaumoo), and bullies-turned-allies Lance (Tom Taylor) and Kaye (Rhianna Dorris) to help him save the world using a children’s book of King Arthur stories as their guide. They are also aided by a quirky, sometimes teenage, sometimes old man, Merlin – portrayed by relative newcomer Angus Imrie and the legendary Patrick Stewart. Though the King Arthur stories have been subjected to Hollywood remakes over and over again, I didn’t find this film cliché and I didn’t feel like it was something I’d seen before. It had a lot of 80s fantasy adventure movie vibes, which I love. The electronic 80s-tastic score reminded me of a mix between Ladyhawke (but not as cheesy) and Stranger Things. It also included are some fun bits from myths that aren’t usually found in these movies. Like the island of Tintagel, portraying Merlin as a teenager because he ages backwards, and showing Merlin’s proclivity for shapeshifting (specifically into a kind of falcon). I’ve seen some criticism of teenage Merlin, but this films portrayal is accurate to the original stories and I thought it fit well in a kid’s movie. Angus Imrie was one of my favorite things about this film and I hope to see him in more things soon. The messages covered in the movie were also good. They were mostly standard kid film things, like bullying and single parent struggles, but they were handled nicely and didn’t feel forced into the story. Even though I thoroughly enjoyed this movie, I do have a few critiques. First is my problem with the CGI. There are times it felt a bit cheesy and not as well done as I had hoped. Morgana is supposed to be this super powerful sorceress and is one of the most prominent antagonists in Arthurian legend, but she was a bit of a letdown. It wasn’t bad enough to ruin the movie, but I expected better. Another thing I have a slight issue with is the way Merlin performs magic. He uses a kind of finger-tutting, which is cool, but felt like it was ripped off from The Magicians. I’m not too upset by it, it just felt unoriginal. The other issue many people had with Merlin is he didn’t help out enough, he kind of left the kids to fend for themselves, but this another nod to the legends. Merlin is traditionally a teacher or advisor, not an all-powerful magical savior. Overall, The Kid Who Would Be King is an entertaining and successful modern retelling of a King Arthur story with many nods to Arthurian myths. The themes and messages of the film were relatable and thoughtfully packed in a whimsical coming of age adventure. So far, I’ve liked director/writer Joe Cornish’s work and look forward to what he does in the future. In my opinion, this is one of the best kids King Arthur themed movie since the animated Sword in the Stone (1963).